Recently, I conducted a Skype lesson with one of my former face to face students from Japan. She pointed out to me that my picture for Skype was the McDonald's Sakura burger. I told her that it was an ancient picture that I really should change. The reason I put it up there was that I had the picture on my desktop, likely for this blog (though I think I never used it). My student pointed out that this burger was being re-released, so I checked it out and, it is back (released March 21). The burger is supposed to have a "faint cherry scent" and you can see that the bun has some pink in it. 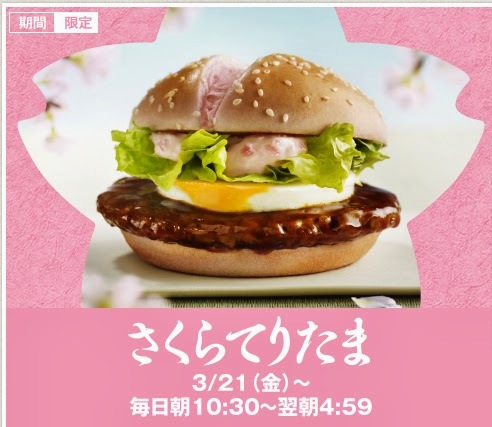 The meat is a pork patty and it includes teriyaki sauce and an egg (it's called sakura teri tama - cherry teriyaki egg). The sauce is mayonnaise based and also includes ginger. Frankly, it all sounds like a real mess of flavors which probably don't have a good chance of meshing. I wouldn't touch this burger with a ten-foot-pole, but then I wouldn't touch any fast food burger. If you give this a try, let me know if all of the flavors play nice together. I'm such a sucker for all things sakura or trying to be sakura flavored. If I could, I'd definitely try it out..